I’m sure you have all seen the many mashups out there, and how can you not, they’re everywhere! You’ve got historical mashups like Abraham Lincoln: Vampire Hunter and then you have a massive amount of literary mashups, such as Pride and Prejudice and Zombies, Sense and Sensibility and Sea Monsters, Little Women and Werewolves and so many more. Well, I’ve got another historical mashup for you – FDR: American Badass. This one isn’t a book though, it’s going to be a movie, a movie about Franklin D. Roosevelt hunting down and killing werewolves. Seriously. Actor Garrett Brawith will be making his directorial debut with FDR: American Badass. We hear that he plans on having FDR track down and kill werewolves like Adolf Hitler, Mussolini and Hirohito in his customized wheelchair of doom. Oh man. The script has been written by comedy writer Ross Patterson, so I think it’s safe to assume that it won’t be anything serious. Personally I think the whole thing sounds like a sad attempt to cash in on two popular fads – werewolves and unoriginal mashups. I am sure Ross Patterson and Garrett Brawith are hoping to ride the success of Abraham Lincoln: Vampire Hunter, the novel by Seth Grahame-Smith which is now being turned into a big time movie. Unfortunately for them, Seth Grahame-Smith is an incredible author with a huge amount of talent – not some guy that that mimics others in the hopes of making it big. So yeah, it’s pretty obvious that I don’t find the idea of our 32nd president wheeling around werewolves entertaining. 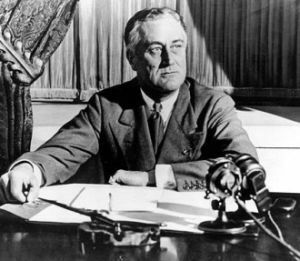 But hell, I’ve been wrong before, so who knows, FDR: American Badass could very well be an awesome movie. What you guys think? Does the film sound like it will be a good one? Or are you sick of all of these mashups? Let us know in a comment below.